William Caxton (ca. 1421-1492) and the printers who immediately followed him, Wynkyn de Worde and Richard Pynson, dominated early English printing. Surprisingly, their ideological impact on English literary history--their transformation of a textual economy based in manuscript production, their strategic development of authorship, their collation of English literature--remains largely unrecognized, overshadowed by the work of later sixteenth-century printers and folded into the general transition from the Middle Ages to the Renaissance. This collection, the first such work on Caxton and his contemporaries, consists of ten original essays that explore early English culture, from Caxton's introduction of the press, through questions of audience, translation, politics, and genre, to the modern fascination with Caxton's books. 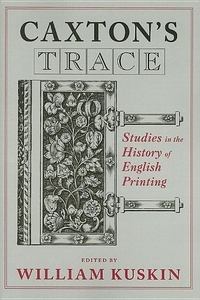 The contributors to this volume approach the study of the printed book as the study of literary culture, and so broaden the traditional terms of bibliography to argue that no full understanding of books is possible without consideration of the larger nature of cultural production and reproduction. On one level, then, the book reads early printers' editions as evolutionary, reproducing preexisting production methods; on another, however, it argues that these printers introduced a significantly new relationship between material and symbolic forms. Thus, Caxton's Trace suggests that the first century of print production is defined less by transition or break, than by a dynamic transformation in literary production itself.